Most of Ummul Kher’s childhood memories involve incidents of fractures—17 in all, and seven surgeries to fix them. The frequent accidents, spurred by a rare bone disease, had a plus though—it prodded her to deal with her insecurities by taking to books with a zeal never seen before in her family; neither of her parents, from an urban Delhi slum area, had even gone to school. And so she excelled at academics, served as headgirl at school, won numerous scholarships. At the other end of town, in Delhi’s Rohini locality, 19-year-old Riya Gupta feels just as helpless, cooped up in front of the computer all day long. Except for one day a month, when she is driven to a spinal injuries centre which has counselling sessions for quadriplegics like her. An ace swimmer at 13, she was forced into a dive in a shallow swimming pool by her teachers, and that caused permanent damage to her spine. “I have been in a wheelchair for the last five years and in all this time accessibility has not improved one bit in public spaces, at least not enough to enable me to venture out on my own. People on the road still stare, awareness continues to be limited,” rues Riya. 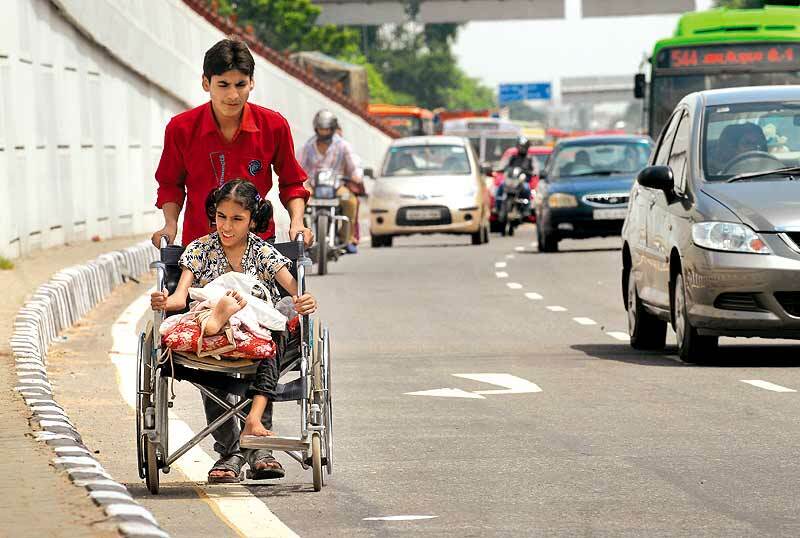 Riya and Ummul both have a pressing, valid question: why has so little changed for disabled persons in India? Why does their lot, and they number roughly 70 million in the country, continue to be an ‘invisible minority’? Right now, a new disability bill draft submitted to the ministry of social justice is under consideration. Among other updated provisions, it speaks of widening the definition of disability, aims to ‘recognise legal capacity, establish national and state disability rights authorities’ and provide better access to information to the differently abled. Meanwhile, the Indian Sign Language Research & Training Centre (ISLRTC) at IGNOU has been set in place just this month to ‘create a linguistic record/analysis of the Indian Sign Language’, the first effort of its kind in India. A few months ago, the ministry of social justice also set up a disability division (empowerment of persons with disabilities), to streamline all kinds of planning and integration in the area. 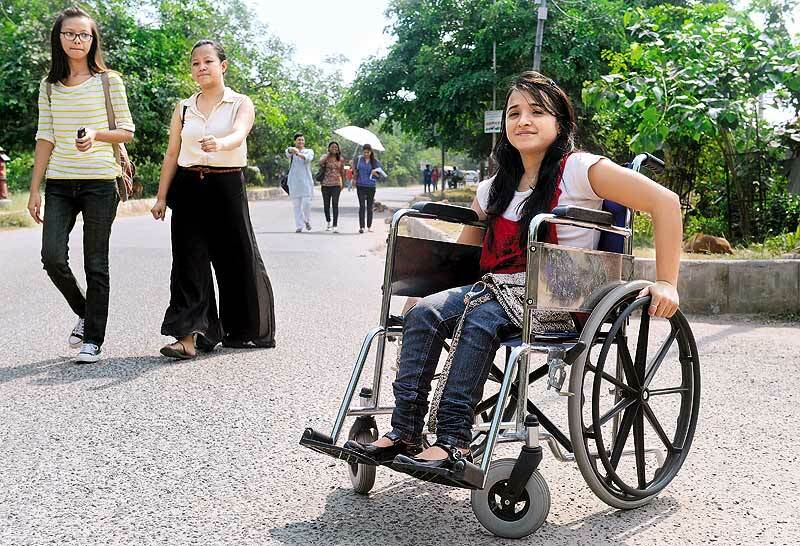 In 2010-11, the percentage of students with disabilities in govt-run schools dropped from 0.75% to a dismal 0.26%. But after decades of neglect and continued stigma, it’s just not enough, say disabled rights activists, calling it just more meaningless laws and regulations on paper. “Disability did not even get factored into the census till 2001. And even though the 1995 Disability Law clearly states that public spaces should be made accessible for persons with disabilities, how many in reality are actually accessible even now? How many of the new buildings that have come up post-1995 are barrier-free?” asks Javed Abidi, founder of the National Centre for Promotion of Employment for Disabled People, and Disability Rights Group. “Isn’t it appalling that India is yet to get a standardised sign language? The nuances of sign language in one city are different from that in another city,” points out Abhijit Dasgupta, who spearheads the Sukriti Foundation for disabled people in Calcutta.Even supporters of the current disability law, like ex-chief commissioner for persons with disability and founder of Amar Jyoti School in Delhi, Uma Tuli, admit that “while this law is currently the best in Asia, a drawback is the lack of provision for penalties for those who do not follow the rules”. 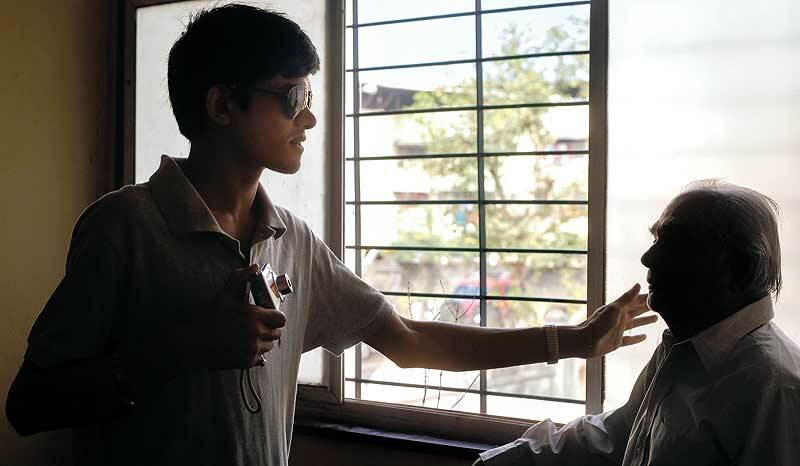 In Mumbai, Mahesh Umrania, 26, who lost his vision to glaucoma 15 years ago, faces a similar issue with the city’s local railway, where incidents of vision-impaired persons falling on the tracks are not uncommon. Worse, the sitarist and photographer continues to face discrimination each time he hunts for a new home to rent in the suburbs. “The landlords ask the strangest questions: how will you keep the place clean, what if you get robbed? How will you eat? How will you dress?” Asha Singha, a sign language interpreter in Delhi, has more subtle concerns. She wonders why TV programmes are still not subtitled. Now here’s a shocker: in 2010-11, the percentage of students with disabilities in government-run schools dropped to 0.26 per cent, a sharp decline from 0.75 per cent the previous year, as revealed in an HRD ministry survey. “There is a systemic problem, in every aspect of nation-building, people with disabilities are always ignored. There is no strong law, no real planning, it’s all token charity,” feels Javed Abidi. The annual Employability Fair will have about 45 companies this year to select nearly 900 people with disabilities. Still, gradually today there is a sense that the private sector may be opening up to inclusion. The Deaf Way Foundation’s Namrata Patro reports that they have an increasing number of corporate employees signing up to learn sign language, to be able to communicate with colleagues with hearing disabilities. A range of fast food joints and hotels are signing up the differently abled to be part of their staff, even seeking out hearing- and speech-impaired people. 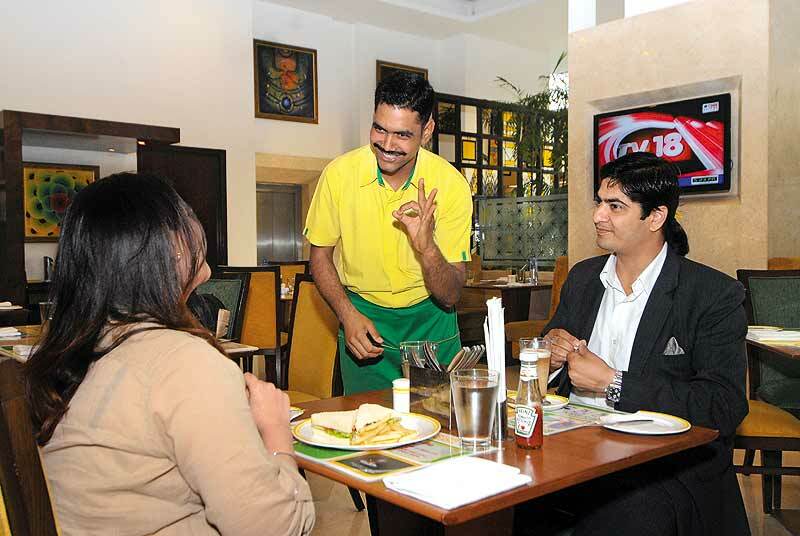 Like Anurag Tripathi, 24, who’s been waiting tables at a star hotel cafe for the last four years. He keeps a special notepad designed for hearing-impaired employees close at hand, and places it in front of customers, where they can scribble in their order. “It’s difficult to adjust with new staff members, because it takes time for them to come to terms working with colleagues with hearing impairment but, yes, there are far more employment opportunities than before,” says Tripathi.Many private firms have approached organisations like Ability Foundation to look at their building plans and suggest changes. “But employers still need to look at giving jobs to disabled persons as an effective and compelling workforce, not just CSR,” says Jayshree Raveendran, founder, Ability Foundation, Chennai. In other words, there is movement, though slow. The annual EmployABILITY Fair, put together by Raveendran’s organisation, which will have about 45 companies this year to select nearly 900 people with disabilities, also challenges “tokenism”. Meanwhile, in Calcutta, Dasgupta invites differently abled participants to an annual adventure expedition, likewise Partho Bhowmick of Beyond Sight Foundation trains blind people to take photographs with still cameras. “Learning photography gives them a certain confidence…to do something others believe they can’t,” the latter says. But these positive stories are too few and far between, often the result of a few individuals’ lifelong struggle. The state as a whole, and its people, continue to be prejudiced and unfeeling towards people who just need a little bit more attention. Blind With Camera Started by photographer Partho Bhowmick of the Mumbai-based Beyond Sight Foundation, Blind With Camera works with a simple idea: to provide vision-impaired people an artistic platform. In 48-hour workshops held in Pune, Mumbai, Bangalore and Delhi, Bhowmick helps collate their work for display at exhibitions held across the country. The project also offers an online photography course; the plan is to introduce photography courses in blind schools. The Blind With Camera E-school, in compliance with web accessibility standard for the visually impaired, throws up basic and advanced tutorials, info about adaptive tools and a platform for students to upload and share their photographic work. 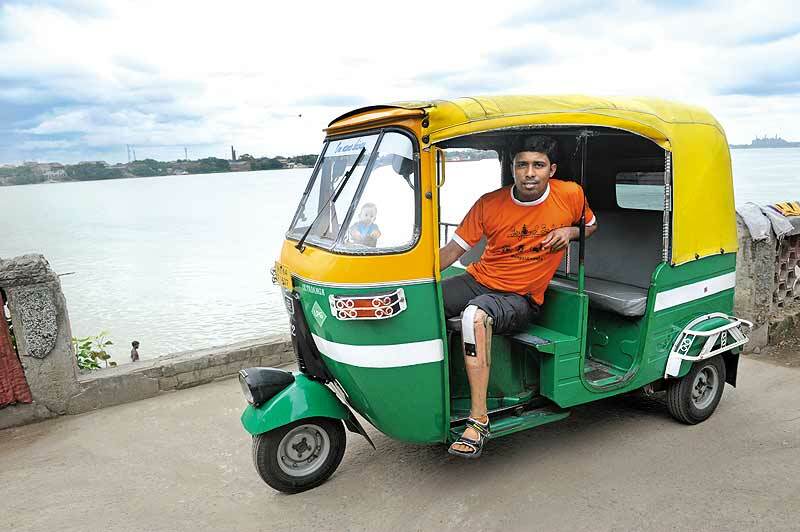 Beyond Belief Every year, young men like Bhola Nath Dolui, an autorickshaw driver in Calcutta with a lower limb disability, get together for the Beyond Belief project, a series of adventure programs and survival training that resembles a television reality show. Led by documentary filmmaker Abhijit Dasgupta, a team of differently abled persons undertake challenges that include scaling high mountains, hiking through deep forests, river rafting in West Bengal, all to prove that people with physical disabilities are differently abled, not ‘disabled’. The project also seeks to boost their employment opportunities. Travel Another India This unusual travel outfit runs a ‘Journey Without Barriers’ initiative, reaching out to physically disabled persons across the world who may want to visit popular tourist hotspots in India, like Ladakh, Spiti, Mysore, Goa, and even lets you work out your own itinerary. One of the few such ventures in the travel sector in India, the idea is to “develop accessible tourism opportunities”, still in its infancy here. The team at Travel Another India works closely with AccessAbility consultancy firm to improve accessibility at various locations. Himalaya On Wheels, another one of their initiatives, makes mountains more accessible to tourists using wheelchairs. EmployABILITY A one-of-its-kind professional annual employment fair, conceived by Ability Foundation in Chennai, it challenges the view that for the corporate sector, hiring persons with disability is merely good CSR. This one is a job fair for disabled persons with educational qualifications, which are duly matched with the vacancies available in 35-45 companies across banking, hospitality, retail, IT sectors. Nearly 900 disabled persons will take part in the fair this year, to be held in the first week of November in Hyderabad. The participants will also be trained beforehand on how to face job interviews. “The fair opens the corporate world up to a whole new pool of skilled persons,” says Jayshree Raveendran of Ability Foundation.